Can I bring my baby along with my preschooler to class? Yes, please do. 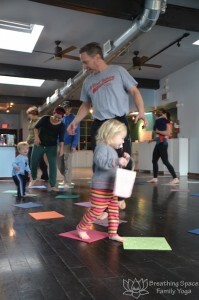 We often have younger siblings in tow for Little Families Yoga classes. They are welcome to nap or be in arms during class. No charge for non-walking siblings, just bring them along. My child is super active/busy. 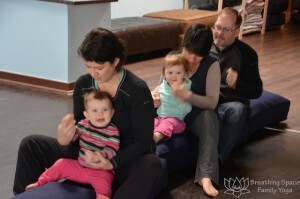 Is Little Families or Preschooler Yoga class appropriate for them? Yep. We move a ton. Generally, if you are enrolling in a class for your child’s age, we are prepared for your child to behave in age-appropriate ways. 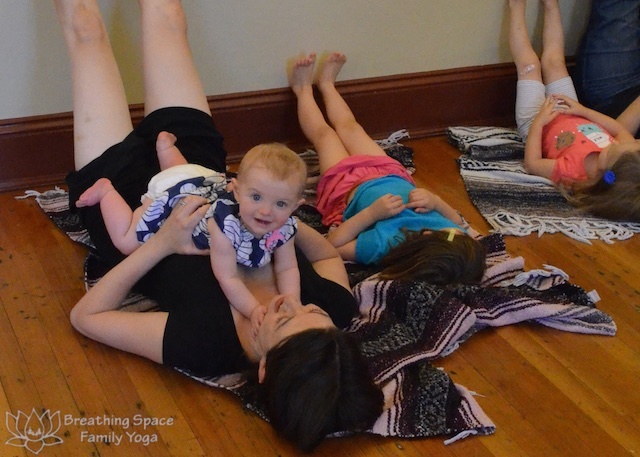 For Little Families Yoga (2-4 yrs), we don’t use yoga mats and instead move all over the room. Some of our students are always on the go and that’s really quite alright. Some toddlers seriously need to move in order to pay attention. Those are the students parents assure me do the yoga poses at home, just never in class. Sometimes those students join in briefly whenever their favorite activities come up and then go back to running in circles. It’s all good. 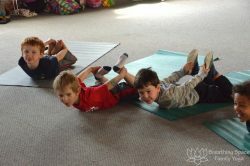 For Kids or Family Yoga (ages 3-6, or 4+), we do use mats and are beginning to learn to be on the mats for much of the class. 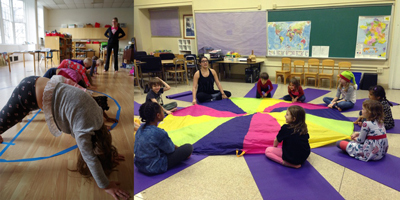 Class is still super active, we move off mats for all sorts of games, and we don’t expect stillness from young children. If your child has special needs, it is helpful to check in ahead of time so the instructor can be prepared and think through lessons and activities with your child’s needs in mind. We are happy to have you enroll and decide after the first class or two if it is the right fit. Again though, check in with the instructor. Parents are typically more worried about possible disruptive behavior than our yoga teachers and will work with you on strategies to help your child succeed in class. All our early childhood classes are taught family-style. Up to two parents may attend these class with the registered child. Little Family Yoga welcomes walking younger siblings to join the fun, no charge for infants under 1 year. Learn more about early childhood classes. 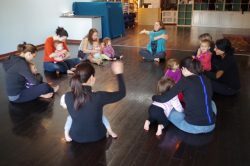 What should I bring to Baby Yoga & Play? Do I need a yoga mat? Please bring a baby blanket and small, quiet toy to all our class locations. Most of our venues have a few yoga mats to lend, but you may prefer your own yoga mat for hygiene or comfort. If so, please bring one. 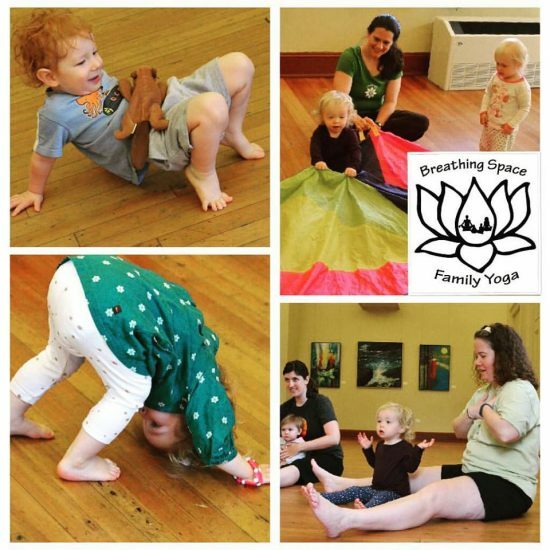 How are Breathing Space Baby Yoga & Play classes different from postnatal yoga or classes offered elsewhere? 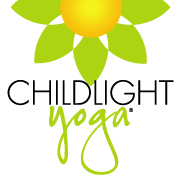 There are a lot of yoga studios advertising parent & baby classes, but it’s sometimes hard to tell from the descriptions what will actually happen in class. Some instructors focus exclusively on mom. They keep the lights low and the room warm in the hopes that baby will sleep. 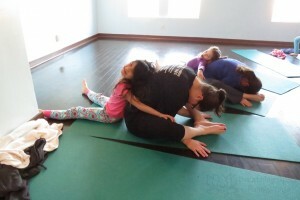 Some instructors incorporate infant massage and movements in the first few minutes of class and then shift their attention to adult yoga for the rest of the class. In a lot of classes, baby’s roll is relegated to being used as a weight, all be it a very cute one. While there’s nothing wrong with any of these approaches, that’s not what we are doing at Breathing Space. 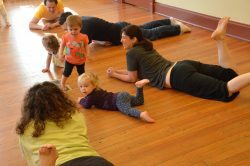 Baby Yoga & Play focuses on the interaction between baby and caregiver with lots of baby-centric activities, but we do incorporate postpartum appropriate stretching and strengthening for caregivers. Grownups in Baby Yoga & Play will also get to do a bit of postpartum-appropriate yoga themselves, including strength- and flexibility-building postures, breathing exercises, and relaxation techniques to address common physical complaints and mental/emotional stressors during the new-parent period. Will I get a workout in Baby Yoga & Play? Do I need workout clothing? It is not designed as a workout for caregivers, but you do need to be prepared to move and we hope you will leave feeling better in your body than you arrived. We spend a good portion of the class sitting criss-cross or in other positions on the floor and we get up and down several times. Almost every class incorporates lunges or squats while holding baby as well as some shoulder or low-back exercises for caregivers. All postures can be modified to address caregiver movement limitations. Comfortable, stretchy clothing is important and jeans are not recommended. My baby is only 3 or 4 weeks old when the class starts, do I need to wait for the 6-week appointment to attend? Generally, class is most appropriate after 6 weeks. We strongly recommend that you be cleared for exercise, especially if you had a surgical birth or complications. Baby too tends to be more ready to participate after about 6 weeks. A 45-minute class is a long time for a newborn. Very young babies often sleep, eat, or fuss their way through class. That said, you are still welcome to come. We’ve had moms happily start class as soon as they are ready to be out and about, modifying exercises that are too strenuous (such as skipping the abs) and addressing baby’s needs as they arise. Sometimes, just being at class is what mom needs. If that’s you, please come. If you would like to wait until the six week mark but class is already starting, don’t fret. Late registration is welcome for several weeks into the series as long as there is room in the class. We are happy to reserve your child’s spot in advance if you contact us. Let’s just get that out in the open. That’s how babies communicate; it’s totally fine. 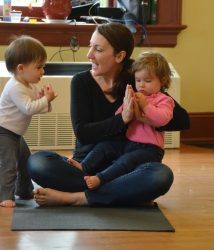 Even the fussiest babies are welcome in Baby & Me Yoga. Your instructor will not be distressed and is happy to have you there and, I promise, the other moms/caregivers have been there and will be far less upset about your baby fussing than you will be. Please join us. What happens if baby needs to eat or be changed or falls asleep during class? That’s fine too. We are not running baby boot-camp. 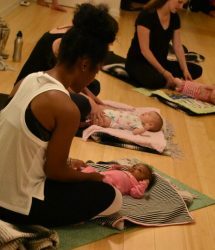 My maternity leave ends before your Baby Yoga class series is over, can I still come? We have never been able to talk babies into being born on our series schedule, so offer a very flexible makeup policy and partial registration. If you are able to commit to the majority of a series, we can set up a partial registration for you at the series rate. Simply contact us with your specific dates. Of course, if your child will be home with a family member or nanny when you go back to work, you are welcome to have the join class when your leave ends.